How many of you love seafood? Now how many of you are too intimidated to cook it at home? Trust me, I get that!! 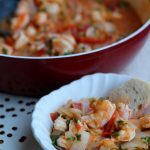 I usually stick to my typical salmon and shrimp recipes over and over, and stay away from anything else. But that’s all changed thanks to a new sustainable seafood company called Love The Wild! To be completely honest, I used to think we should only eat wild caught fish, but that’s also because I didn’t know anything about aquaculture. Turns out, farmed fish can actually be really good for you and environmentally friendly. In fact, it’s the most resource efficient animal protein option out there. It requires less feed and fresh water than chicken/pork/beef, and no other animals are unintentionally harmed by fishing lines and nets. Not to mention, it relieves pressure on wild fish stocks by preventing overfishing. Instead of depleting our fish supply faster than they can repopulate, farmed fish can keep up with the demand of the public without worrying about that. And even though wild fish might seem cleaner, the process often has a much larger carbon footprint, and they can’t guarantee that they weren’t exposed to any pollutants in the water. Of course, not all farmed fish are created equal.The key is to look for for certifications (Responsibly Farmed ASC, Whole Foods Market Responsibly Farmed, etc). These certifications ensure that you are getting fish that was responsibly farmed without any added chemicals/hormones. 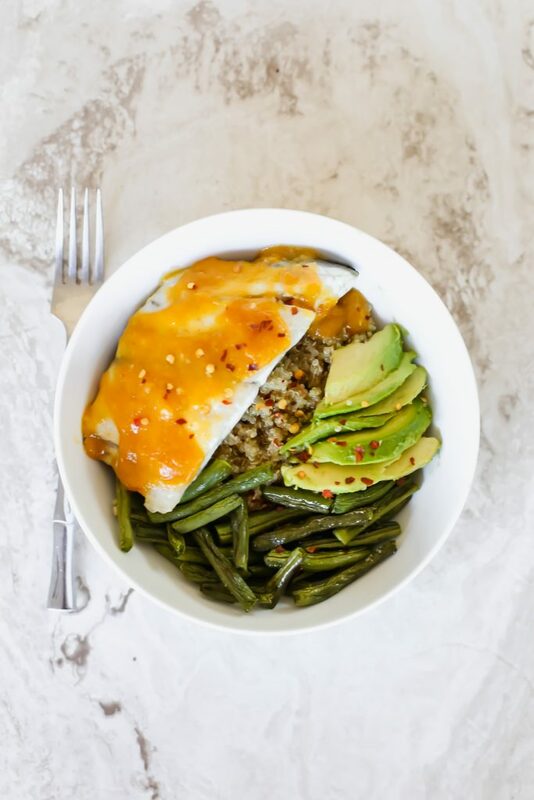 Oh, and in case you’re worried about this -farmed fish have the same omega-3 content as wild fish, and your body processes and absorbs the nutrients from wild and farm raised fish the same way. Woo! 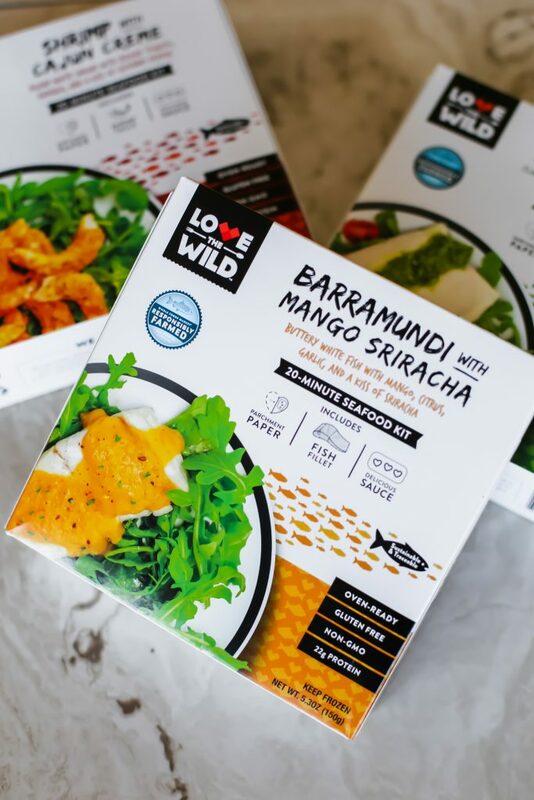 Love The Wild is on a mission to make quality seafood attainable and affordable… but also easy to cook! There’s nothing worse than spending money on seafood and not knowing what to do with it – especially when that prevents you from even cooking it at all! So, this company created 20-Minute Seafood Kits with 4 different types of fish and sauces that compliment their natural flavor. 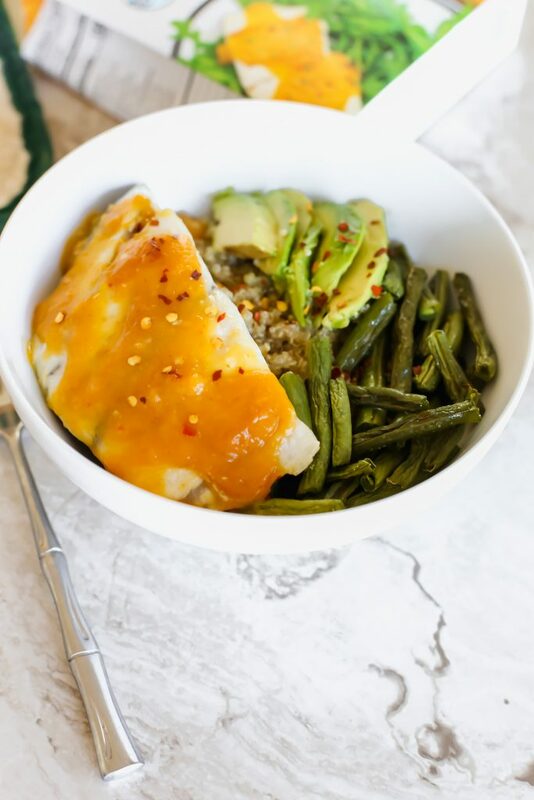 I’ve tried the Rainbow Trout with Salsa Verde, and you see the Barramundi with Mango Sriracha pictured in this post. 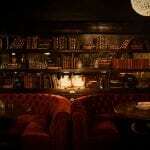 I’m also dying to try their Shrimp with Cajun Creme and Salmon with Maple Mustard. YUM. But the best part? 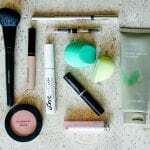 The kit comes with everything you need. 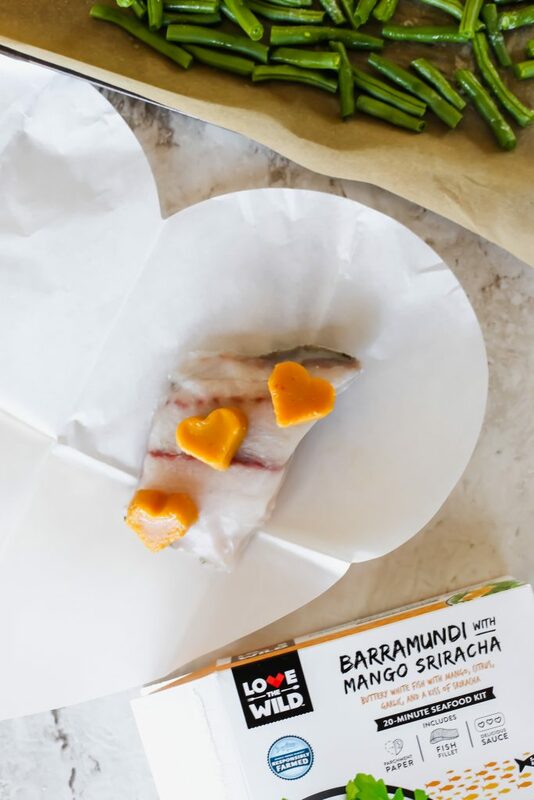 Just open up the parchment paper, add the frozen fish, and then put the cute frozen hearts of sauce on top. 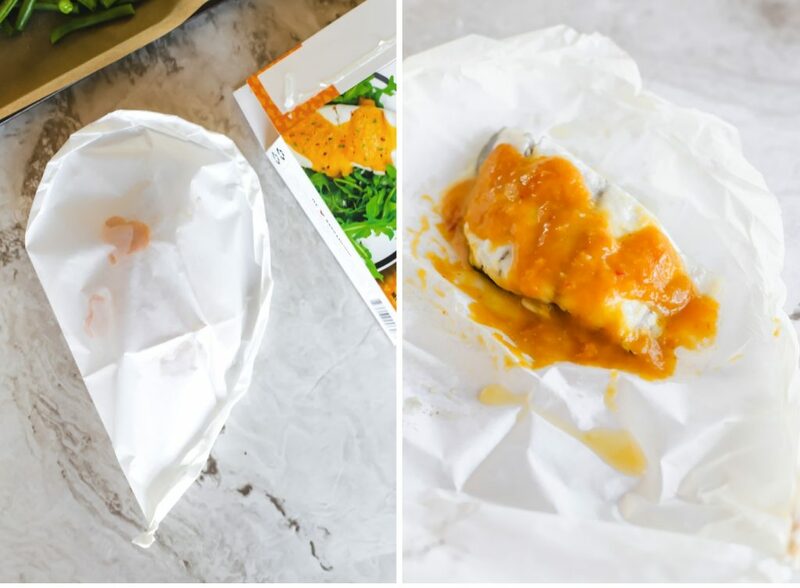 Fold the parchment paper over, seal it up, and put it in the oven! 20-25 minutes later, you have a beautiful dinner! They also have microwavable bowls in you’re even more pressed for time. 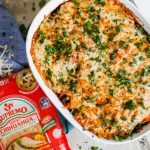 If you’re not a microwave person (or you don’t have one – city life! ), you can also add the contents of those bowls to a pan on your stovetop! Just add a little water and cover the pan, allowing everything to defrost and warm up. And just in case you need more convincing, most sustainable seafood is more nutritious than any other animal protein you can put on your plate. If you’re trying to incorporate more protein into your diet, Farmed Atlantic Salmon, Shrimp, and a few other varieties actually have more protein per gram than beef! Whaaat?! They’re also full of vitamins like Vitamin E and Vitamin B12. And we all know about those trusty omega-3 fatty acids! 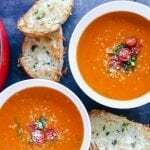 Anti-inflammatory and good for your heart and brain? Sign me UP. 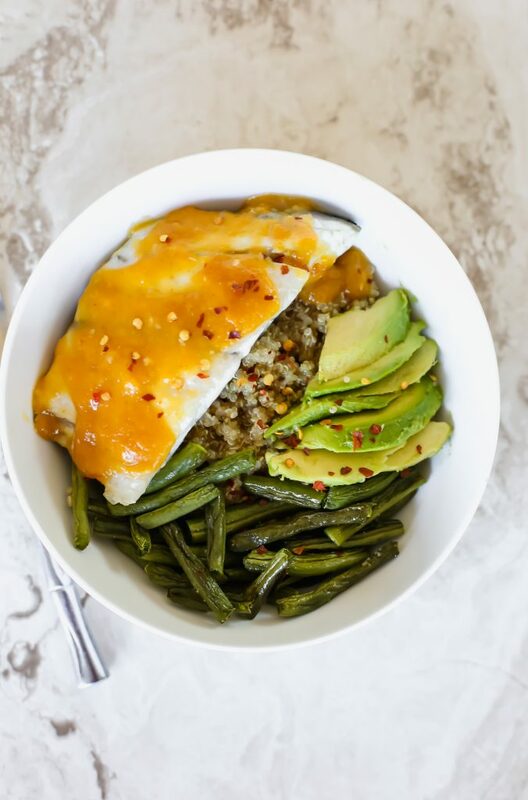 I put this barramundi with mango sriracha on a bowl of quinoa with avocado and roasted string beans. 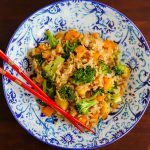 It would also be delicious over a salad or even pineapple fried rice! 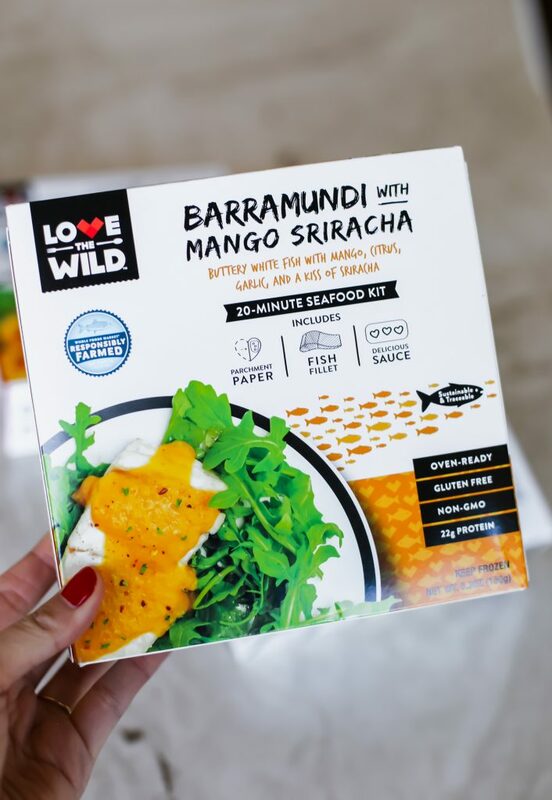 You can find these Love The Wild Seafood Kits at most Whole Foods in the Chicagoland area. (You can check here!) They also sell them on PeaPod and Fresh Direct! Don’t forget to turn the box around when you get it, too. You can read exactly where your fish was farmed and who helped get it from that water to your freezer. I think it’s so cool that they are so transparent about their supplier relationships, so we have the opportunity to be informed about where our food is coming from. Such a fan. 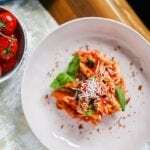 Have any of you tried these seafood kits yet? *This post was sponsored by Love The Wild, but (as always!) all opinions are my own. Thank you for supporting the brands that make Lake Shore lady possible! PS. 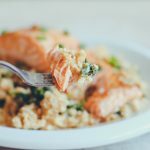 You might also like Ginger Salmon with Cauliflower Rice and Instant Pot Risotto with Garlic Shrimp.